Promote tasteful commercial design while increasing nighttime visibility with the charming Barn Light Shade. This large commercial gooseneck features an 18" Barn Light Shade on a gently arching arm. All parts are aluminum, and a sturdy back plate installs easily over a standard 4" round or octagonal junction box. The widely sweeping shade of 18" Barn Lights lends well to large sign lighting projects and also for building perimeters. Order commercial gooseneck fixtures online with standard incandescent lamping (200W max), or upgrade to CF or metal halide (MH) Barn Lights. 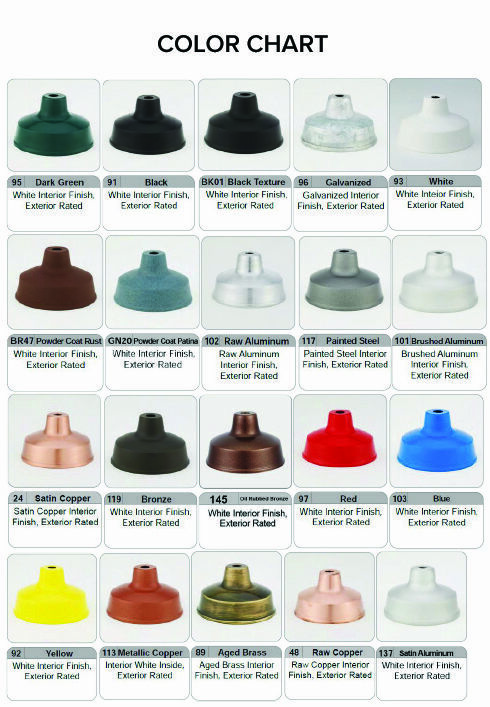 Paint finishing is a rust resistant powder coat available in 25 shades; 5 at no additional cost. Accessories like decorative glass globes and wire guards can also be added online (see drop-down menus for pricing). For custom Barn Light and gooseneck arm combination, or to order high pressure sodium and LED fixtures, please call toll free for a price quote. Outdoor gooseneck lights are UL Listed for exterior applications (US and Canada).